I get antsy before a big trip. What if I have a lousy time? What if I don’t get any good pictures? What if I don’t get to meet any new people? As with several areas in my life, I tend to go to worst-case-scenario in my brain before anything actually happens. One of the things I love so much about Samantha is that she listens to all of my neurotic fears, then puts them to rest with love and support. It’s pretty great; I’m very lucky. I’m also lucky in that I am writing today’s post from sunny California! Months ago, an announcement was made about a Route 66 tour in the Painted Desert, near Holbrook Arizona, that would showcase some hard-to-reach abandoned sections of the Route. I really wanted to go, but knew with the wedding and everything else this year that it was not really in the cards. As I mentioned above, Sam is very supportive; she insisted that I make a trip west happen so I could partake in this rare opportunity. Since I don’t like to go small, I decided to go ahead and make a full week of it & see a big chunk of Route 66 that I’ve never seen before: California, Arizona, and a little bit of New Mexico. This a solo trip, sadly, but none of my trips are truly alone. I have a lot friends that travel vicariously through me and I meet a lot of new friends as I go. Not to mention meeting up with old friends, which is how I started things off! I landed at LAX this afternoon and had a relatively pain-free time getting my baggage and rental car sorted. As I was in this process, my friend Doug (who is putting me up for the night) gave me a ring and asked if I wanted to get lunch. I can always eat, so we made plans to meet at a classic LA diner named Panns. I first met Doug in 2009; he generously hosted me and my party as I was about to leave the country on my great international journey. He is a tremendously kind and generous human being, and I relish any opportunity I have to knock back a few beers and hear the many stories he has accumulated. Unfortunately for my empty stomach, it turned out that the diner closed RIGHT as I arrived, so we just made plans to meet up later at his house. As soon as we parted, I drove straight to the Santa Monica Pier. The pier is a lively place, full of amusement rides, fair-type food, and touristy gift shops. It reminded me of Coney Island in New York, actually, though the temperature here was WAY nicer than it was watching the Polar Bear Plunge in the Atlantic. I stood on the pier and watched the masses swim, surf, and otherwise enjoy the Pacific. I have missed the sound of the waves crashing on the beach. After my little moment of zen, I walked further down the pier to find The End. 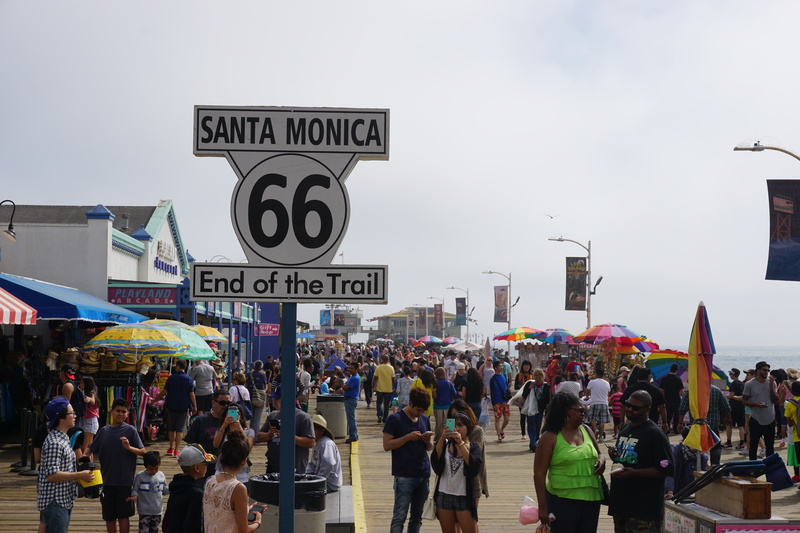 There’s a marker on the middle of the boardwalk that signals the end of Route 66. After taking my requisite photos, I walked down to the very end of the pier to find the Last Stop Shop. 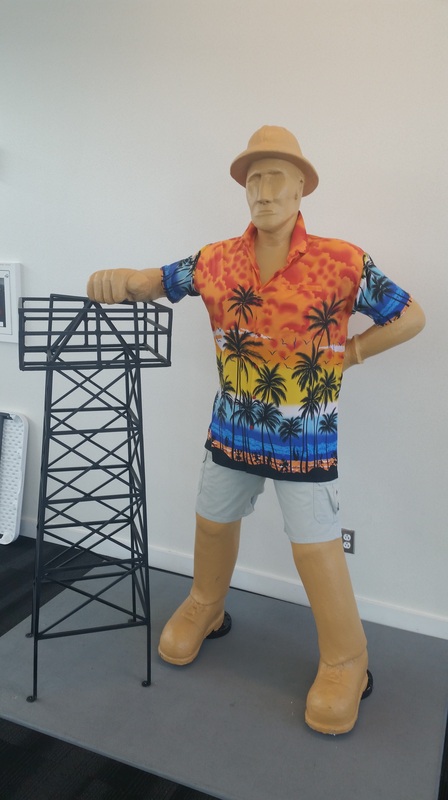 They have a tribute to the late, beloved Route 66 artist Robert Waldmire overlooking the ocean. I walked into the little shop, bought a t-shirt, and gabbed with one of the owners for a few minutes. We talked about the Route in LA and I shared my journey plans with him. It was a short conversation, as the place was busy (something I’m always thankful for when it comes to Route 66 shops) and I left with a souvenir I’ll treasure. As I walked back to the parking garage I’d stowed my rental car at, I stopped a place that is less well-known than the End of the Route marker I’d just visited. 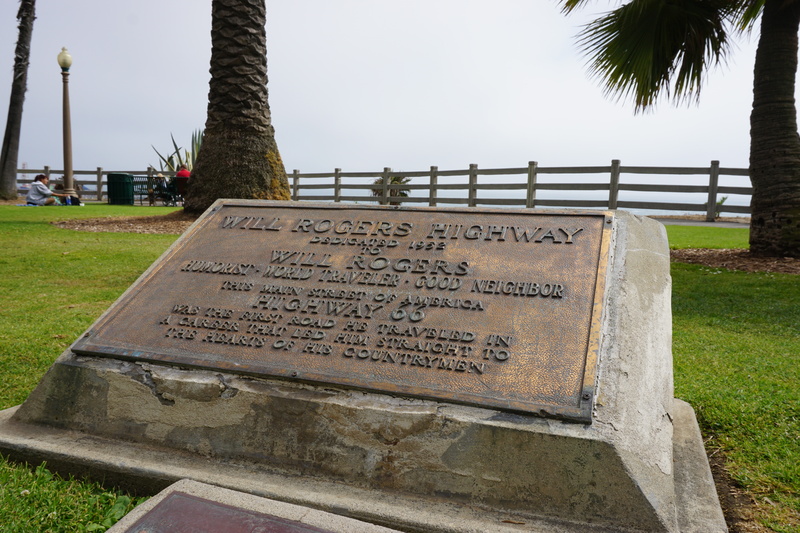 A short distance north of the pier, just off the beach, is a little bronze plaque denoting the end of the Will Rogers Highway, which is one of Route 66’s more enduring nicknames. Considering my connection to Will Rogers, it meant more to get a few snapshots of that marker and spend a few moments in solitude with it, a luxury that probably NEVER accompanies the main sign on the pier. Satisfied, I walked to the car and headed to Century City so I could get a few pictures of the Fox Plaza, better known to action movie fans as Nakatomi Plaza from the first Die Hard film. It’s not on the route, but I’ve had this building on my radar for YEARS. I had to drive by and get a few pictures. By the time I wrapped up there and mapped Doug’s house in Signal Hill, it was about 5:30 PM. I hadn’t really thought about Los Angeles rush hour traffic, and I paid for that with a slow, nerve-wracking crawl along the interstate. Additionally, I still hadn’t eaten since breakfast; I didn’t take the time change into effect, either, so by the time I arrived at Doug’s I hadn’t eaten in about eleven hours. Whoops! Thankfully, Doug gets me, and we dined at In-n-Out burger while we caught up. 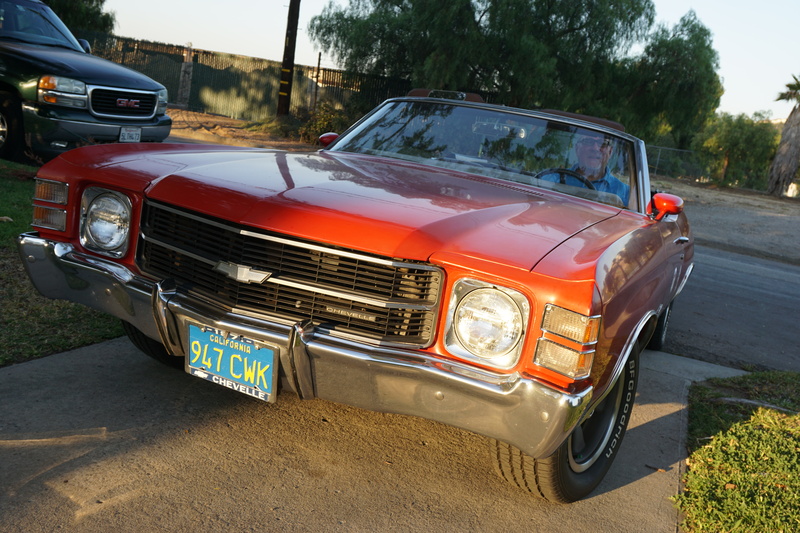 We also took his classic convertible Chevelle to dinner, which is something that always makes me grin like a five-year-old that gets to go play in the ball pit. Tomorrow brings a day full of Route 66 goodness, as I’ll be driving from LA to Needles, CA. Lots of stops along the way; hopefully I won’t be too tuckered out to let you all know how it went! This entry was posted in Route 66, Travel and tagged California, Chevelle, Los Angeles, road trip, route 66, Santa Monica, travel, Will Rogers. Bookmark the permalink.